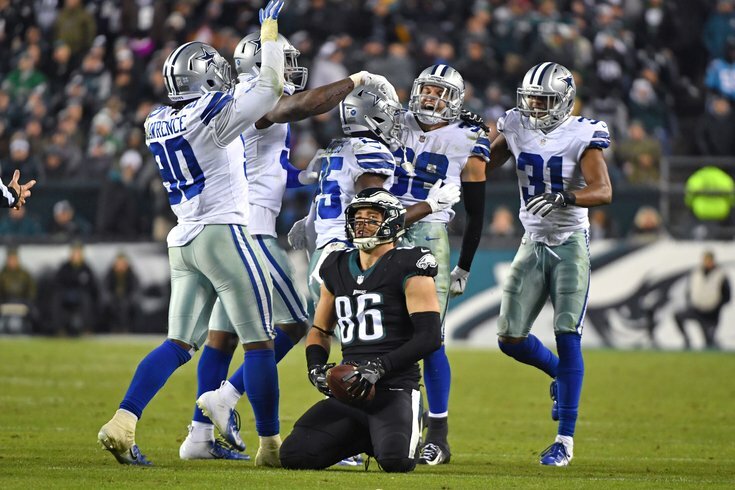 Philadelphia Eagles tight end Zach Ertz sits on the field after being stopped on fourth down by the Dallas Cowboys. On Sunday, the struggling Philadelphia Eagles — in desperate need of a win — will head into a hostile environment to face the hottest team in the NFL, the New Orleans Saints. The Saints have won eight straight games and are averaging a league-best 36.7 points per game. What could possibly go wrong for Doug Pederson's team? The Philadelphia Eagles will be wearing their home green uniforms in New Orleans on Sunday for their matchup against the Saints, as Sean Payton’s bet with Doug Pederson is finally coming due. The Saints, according to McManus, will be wearing their all-white Color Rush uniforms. Normally, I make up my own headlines for each section. But, try as I might, there's no way to top the one above, which was the actual headline on Dan McQuade's post for Deadspin. Dan McQuade: As you can see today, I am dressed in all black to mourn what appears to be the end of my Eagles’ season. Especially after we made fun of the Cowboys last week, they come out and basically control the game against the Eagles for almost all of Sunday night. Dom Cosentino: The Eagles have had some injuries in their secondary, but we’re beyond the point where that’s going to be an excuse for them, I think. The division is still up for grabs — Washington only has a two-game lead on both the Eagles and Dallas, so it’s not over, but it’s a bad division. I think a wild card prospect is certainly out of the question for any team in that division at this point. And the Eagles' schedule coming up is kind of brutal. You’ve got the Saints and the Rams still on the slate, so, sorry. DM: Yeah, it’s funny. Everyone is Philadelphia was sort of on a high for the months since the Super Bowl, and then ever since that first game, it’s been a rough season. They’ve only really blown out one opponent and that was the Giants. Of course you remember Jason Kelce's epic rant from atop the Art Museum steps back in February. But this week, Kelce's latest rant wasn't in defense of his teammates, but rather questioning the accountability of the whole team, himself included. It began with Kelce holding himself accountable for his part in a 4-5 Eagles season. Kelce tried on multiple occasions to explain what he really meant. He didn’t intend to rip the effort of anyone. It was more about consistency. The words were similar to those voiced by Pederson after the 27-20 loss Sunday to the Cowboys. Speaking of the veterans, Doug Pederson held a meeting with his team leaders recently. These are trying times at the NovaCare Complex. And the Eagles need their leaders now more than ever. Pederson said the group of players was obviously disappointed. After a loss to the Cowboys and a 4-5 start to a season that began with Super Bowl aspirations, that seems like the right emotion. But he also said they were in a good place and excited to get back on the field. Dave also asked the leaders in question — including Wentz, Kelce, and Malcolm Jenkins — what they believe their roles are heading into this crucial stretch of their schedule. It's worth checking out. Pederson opted for a rookie running back who is less than stellar in short yardage to get the first instead of calling for a quarterback sneak with Wentz. The decision is questionable to begin with, and Pederson should be cognizant that the line isn’t performing as well as it did last season. The question remains, is it too late to fix the Eagles?